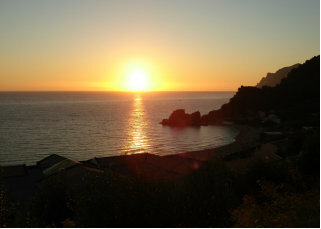 All tours are designed to introduce guests to landscapes of Corfu that they could not see in any other organized tour. Ctt tours include sampling original Corfian goods, visiting traditional villages in the most remote areas of the island, sightseeing among the most spectacular views with steep cliffs, castles and Monastery’s which are located in Paleokastritsa and Lakones ,as well as swimming in magical beaches with gold sand and crystal clear water. In the west coast we visit the village of Pelekas with the famous Kaiser’s observatory. ……. This tour begins at your accommodation, quite early in the morning and after taking a 1.30 hour ferry to Igoumenitsa .We begin our trip to Kalambaka which is approximately a 3-hour drive where we can stop for coffee or a snack and then we ascent to the monasteries. We will visit 2 or 3 Monasteries (your preference)and then return to Kalambaka where we can stop for lunch before taking the way back to the port of Igoumenitsa .Our tour ends by returning you back to your holiday accommodation. goal is to introduce Corfu island to guests who would like to discover, within a short period of time, all the beauties of one of the most popular tourist destinations in Greece.If you already are in Corfu, or your stay here is limited, trust the knowledge, the experience,the high quality services and you will leave the island with the best impressions. 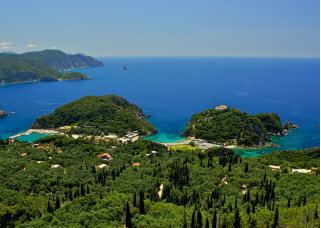 Corfu Taxi Tours has the abilityto make your pass from Corfu an unforgettable experience. My name is Makis Ziniatis i am 42 years old and i come from a long, traditional family of drivers. I have been a professional driver for over 20 years and i have worked hard trying to achieve my goal, wich is doing what i love and at the same time offering customers high quality services at reasonable rates. This goal led me to form TaxiToursCorfu.gr with two of my co-workers ( Spiros Kritikos, Dimitris Dafnis ) with whom we share the same ambitions.We are all English speaking, non smokers and with a wide knowledge of Corfu island. Our goal is to introduce are guests to landscapes of Corfu that they could not see in any other organized tour, sample original Corfiot food and visit the best beaches of the island making your visit an unforgetableexperience. 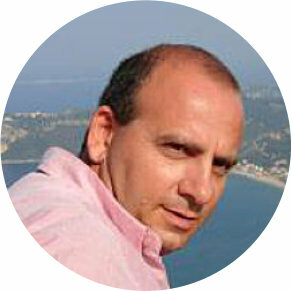 THE FOUNDER OF CORFU TAXI TOURS has a stellar reputation for providing high quality services.Born and raised in the old city of Corfu, Spyros comes from a long family of drivers. His love of Corfu hasled him to discover the most unique parts of the island. He has been a professional driver for over 20 years.He speaks English fluently and has a wide knowledge of the islands historic sites; therefore he can deliver a tailor-made tour suitable tofulfill every client's need. He believes that people who visit Corfu should be able to explore the islands nature, history and culture.Corfu Taxi Tours specializes in introducing visitors to the life of the locals, in a rich and colorful way trough crystal clear beaches,traditional villages and Archaeological sites. Spiro’s' love and enthusiasm towards Corfu can be seen in every step of the tours he provides.  Taxi Tour 1, about 3 hours. 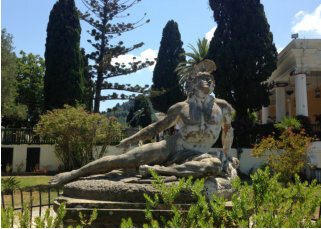 A tour that revolves around two of the most important and historic sights of Corfu, Achillion Palace and Kanoni.We will visit Princess Sissy’s home and its breathtaking gardens and monuments, as well as Kanoni with its spectacular view of Vlacherena and the Mouse island. During our three hour tour we will also visit Pelekas and Gastouri. The length of stay at Achilles museum is 40 to 50 minutes, depending on each guest’s preference. The entrance fee for Achillion Palace is 8 Euros. 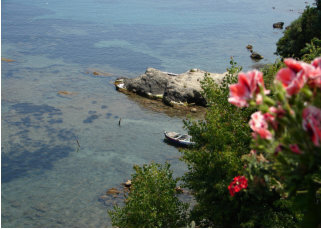 Normal root: Port, Pelekas, Achilleion Palace, Perama, Kanoni, Mouse island and back to Corfu old Town or Corfu port.  Taxi Tours 2, about 4 hours. A different tour, based on the natural beauty of the island, since it mostly includes, traditional Corfiot villages, spectacular views and of course one of the most beautiful resorts in Corfu, Paleokastrttsa village. A tour especially designed for nature lovers and photograph enthusiasts. Towards the end of this 4 hour tour we will visit the Monastery of Paleokastritsa and stop for pictures of the breathtaking views of Kanoni. Normal Root: Port,Doukades, Krini, Makrades, Lakones, Paleokastritsa, Monastery of Virgin Mary, Kanoni, Mouse Island and back to Corfu Old Town or Corfu Port.  Taxi Tours 3, about 5 hours. A combinations of tours 1 and 2. Five hours will be more than enough to explore all the beauties of the Island as well as the highlights of Corfu like Achilleion Palace,Paleokastritsa and Kanoni .We will have enough time to explore the natural beauties of Corfu by sightseeing around the most spectacular views and learn a little bit about the islands culture by visiting local villages where we stop for olive and wine tasting . The length of stay in the Achilles museum is 40 to 50 minutes, depending on the preference of each guest. The entrance fee for Achillion Palace is 8 Euros. Normal root: Port,Doukades, Krini, Makrades, Lakones, Paleokastritsa, Monastery of Virgin Mary, Achilleion Palace, Kanoni, Mouse Island and back to Corfu Old Town or Corfu Port.  Taxi Tour 4, about 6 hours. This tour is the same with tour 3 except it includes an extra hour for a swim at Glyfada beach. Six hours will be enough to explore all the beauties of the island as well as see all the highlights of Corfu like Achilleion Palace,Paleokastritsa and Kanoni and have extra time for a swim at Glyfada beach.The entrance fee for Achileon Palace is 8 euros. Normal Root: Port,Doukades, Krini, Makrades, Lakones, Paleokastritsa, Monastery of Virgin Mary, Glyfada beach, Achilleion Palace, Kanoni, Mouse Island and back to Corfu Old Town or Corfu Port.  For people who like Golf. A special tour for golfers with limited time in Corfu. WE will meet you at the port (if you come by cruise) or to your hotel and we will driver you at the Golf Club where you can spend as much time as you like, and after we will drive you back to the port or back to the Esplanade square where you can explore Corfu’s historic old City. Normal root: Port,Ermone Golf club and we will be back after 2,3 or 4 hours.  For people who love sandy beaches. A special tour for visitors with limited time in Corfu. We will drive you at Glyfada beach where you can spend as much time as you like, and after we will drive you back to the port or back to the Esplanade square where you can explore Corfu’s historic old city. We will meet you at the port (if you come by cruise) to your hotel if you are already you are in Corfu. Normal root: Port,Glyfada beach and we will be back after 2,3 or 4 hours. 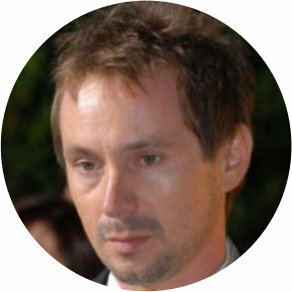 My name is Makis Ziniatis i am 42 years old and i come from a long, traditional family of drivers. I have been a professional driver for over 20 years and i have worked hard trying to achieve my goal, wich is doing what i love and at the same time offering customers high quality services at reasonable rates. This goal led me to form TaxiToursCorfu.gr with two of my co- workers ( Spiros Kritikos, Dimitris Dafnis ) with whom we share the same ambitions.We are all English speaking, non smokers and with a wide knowledge of Corfu island. Our goal is to introduce are guests to landscapes of Corfu that they could not see in any other organized tour, sample original Corfiot food and visit the best beaches of the island making your visit an unforgetableexperience.  Taxi Tour 1 about 3 hours. 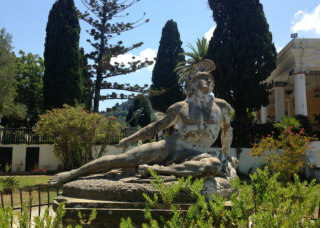 A tour that revolves around two of the most important and historic sights of Corfu, Achillion Palace and Kanoni.We will visit Princess Sissy’s home and its breathtaking gardens and monuments, as well as Kanoni with its spectacular view of Vlacherena and the Mouse island. During our three hour tour we will also visit Pelekas and Gastouri. 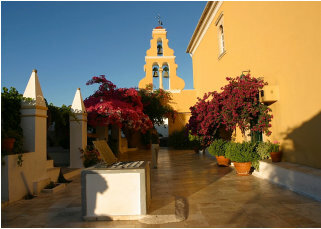 The length of stay at Achilles museum is 40 to 50 minutes, depending on each guest’s preference. The entrance fee for Achillion Palace is 8 Euros. Normal root: Port, Pelekas,Achilleion Palace, Perama, Kanoni, Mouse island and back ti Corfu old Town or Corfu port.  Taxi Tours 2, about 4 hours. 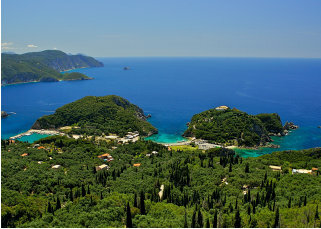 A different tour, based on the natural beauty of the island, since it mostly includes, traditional Corfiot villages, spectacular views and of course one of the most beautiful resorts in Corfu, Paleokastrttsa village. A tour especially designed for nature lovers and photograph enthusiasts. Towards the end of this 4 hour tour we will visit the Monastery of Paleokastritsa and stop for pictures of the breathtaking views of Kanoni. Normal root: Port,Doukades, Krini, Makredes, Lakones, Paleokastritsa, Monastery of Virging Mary, Kanoni, Mouse island and back to Corfu old Town or Corfu port. 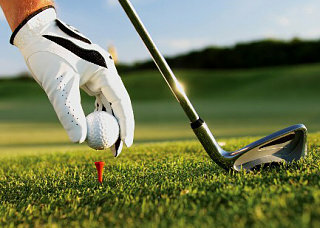  For Golfers A special tour for golfers with limited time in Corfu. WE will meet you at the port (if you come by cruise) or to your hotel and we will driver you at the Golf Club where you can spend as much time as you like, and after we will drive you back to the port or back to the Esplanade square where you can explore Corfu’s historic old City. Normal root: Port,Ermone Golf club and we will be back after 2,3 or 4 hours.